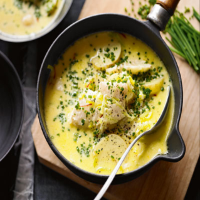 This hearty fish soup is packed with leeks and potatoes. Serve with rustic seeded bread. 1. Place the saffron threads in a small bowl and add 1 tablespoon of boiling water. Leave to infuse for 10 minutes. Meanwhile, melt the butter in a large pan and cook the leeks for 5 minutes, uncovered, over a medium heat. 2. Stir in the potatoes. Add the milk, stock and saffron liquor, bring to the boil and season well with freshly ground black pepper. Cover and simmer for 10 minutes, or until the potatoes are tender. 3 .Gently lower the haddock into the pan, cover and simmer for 5 minutes, until the fish starts to flake and is just cooked. 4. Pour into soup bowls, garnish with the chives, and serve with chunks of seeded bread. There is no need to add any salt to this soup, as the salt in the smoked fish will usually be enough.